Silicon Valley’s popular approach to creating new ventures is rooted in trial and error—test markets with new concepts and a minimum amount of capital – and hope for valuable businesses to emerge. But this “fail fast, pivot often” approach doesn’t apply, if you want to build a highly valuable and world changing business. 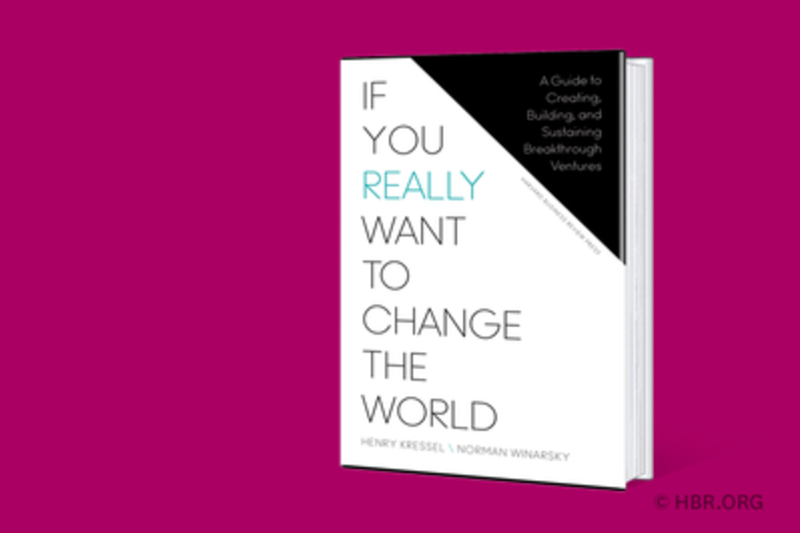 In IF YOU REALLY WANT TO CHANGE THE WORLD: A Guide to Creating, Building, and Sustaining Breakthrough Ventures (October, 2015), Henry Kressel and Norman Winarsky—veteran technologists, inventors, and investors in launching successful new ventures including Apple's Siri (Winarsky)— help entrepreneurs aim high, and build lasting companies with a new method. Norman Winarsky is a venture advisor, lecturer, author, and angel investor. He is past President of SRI Ventures at SRI International, a world-leading research institute founded by Stanford University in 1946. He has been a founder and leader of SRI’s venture strategy and process, which has resulted in more than seventy ventures worth over $20 billion, including companies such as Nuance, Intuitive Surgical, and Siri. Norman is also a lecturer at Stanford University, and co-author with Henry Kressel of "If You Really Want to Change the World; A Guide to Creating, Building, and Sustaining Breakthrough Ventures", published by Harvard Business Review Press. Norman helped create and build companies in areas ranging from artificial intelligence, natural language, and computer vision, to medical devices, robotics, and nanotechnology. He has been a board member or board adviser to many of these companies. He was a cofounder and board member of Siri, which was spun out from SRI in January 2008 and acquired by Apple in April 2010. Siri has become a worldwide phenomenon, establishing the breakthrough market category of virtual personal assistant. Before joining SRI, Norman was vice president of the Mathematics and Computer Science division at RCA Laboratories and Sarnoff Laboratories. He was also a visiting scholar at Stanford University, an invited member of the mathematics department of the Institute for Advanced Study, in Princeton, New Jersey, and a mathematics professor at the State University of New York at Albany. In 2000, Norman and his team won an Emmy Award for outstanding achievement in technological advancement relating to the development of HDTV. In addition, he has received RCA Laboratories’ highest honor, the Sarnoff Award. Norman works with entrepreneurs, startups, research institutes, and major companies to create breakthrough ventures or products. He also advises them on the framework and practice for successful innovation.